2015-12-16 - So Long 2015! I know it's a few weeks early, but the year of PubGuys Trivia has come to a close. 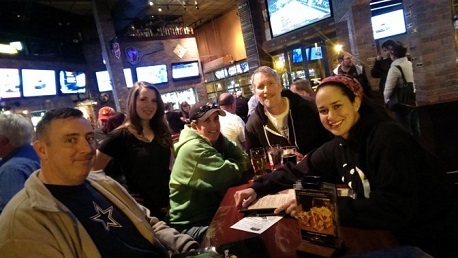 Wednesday night was our final night of trivia for 2015. Don't worry, we'll be back and better than ever in 2016 starting January 6th. We're looking to continue building on the incredible success we've seen this year and we'll need you guys every step of the way. Here are just some of the highlights of 2015 for the PubGuys. These are truly just a few of the highlights in terms of trivia. Other items that deserve mentioning, we held the 3rd Annual PubGuys NCAA Tournament Challenge, we raised money for a member of the WOB family following a July 4th incident, we participated in countless brewery feature nights, and we had our 2nd Ugly Holiday Sweater contest last night (pics coming soon). As the holiday season approaches, we would like to truly thank you for spending your Wednesday nights with us each week. We aspire to bring you the best pubtainment products and we hope you enjoy interacting with us as much as we love seeing you week after week. I say it week after week and I hope it doesn't get old, but you guys are absolutely the best and we wouldn't be doing what we do if we didn't feel that way. Congratulations to our winners and to all our teams in 2015. Enjoy the holidays, drink some good beer, and study up for next year!